Nothing to create or manage yourself. You can be as involved or uninvolved in the development of your app as you want. •It’s Easy – It only takes a few minutes to register your app and provide us with the information we need to develop it. •It’s Quick – Once we receive your information, we will give you a timeline for your app. Most apps are released in only a matter of weeks. •It’s Affordable– Our goal is to help ministries of all sizes be able to use this kind of technology. You can either pay one-time or on a monthly basis. Click HERE to discover the Benefits of a Church App. Both an iPhone/iPad and Android app. 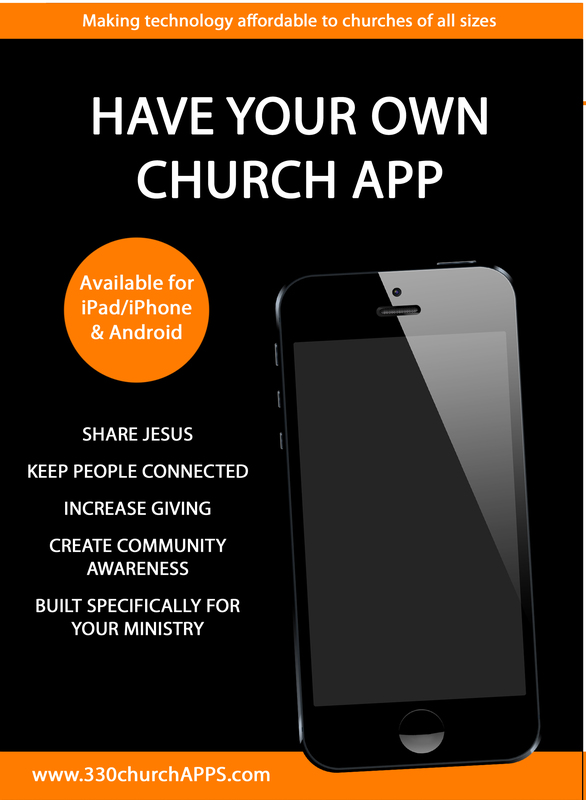 Information to help you promote your app both in your church and community. Your app will include: Your church information and logo, a location map, touch-of-the-button calling and emailing, direct access to your website and social networks, an easy way to share the Gospel, easy access to Scripture, topical Bible verses, the ability to email prayer requests and more. (See a Basic app outline HERE.) You can also upgrade your app for additional features. Enhanced Apps: You can upgrade your app get additional features such as a graphically enhanced menu, Scripture notifications, easy access to online sermons, pre-written text and email invitations to your church, family devotions as well as other custom and advanced features. Learn more HERE. Samples – See both Basic and Enhanced App Samples HERE. I Have Questions…By all means, please ask us. You can reach us at resources@threethirtyministries.org or use the form below. Simply fill out the form below. It only takes a few minutes. Then we will contact you to give you a price quote and to answer your questions.